The technology group Wärtsilä and Aalto University in Finland have signed a Partnership Agreement that aims at strengthening and broadening their current cooperation. The challenges related to climate change, scarcity of natural resources and digitalization call for creative solutions that require new research, talent and ideas. Wärtsilä and Aalto University are looking to take on these challenges together by stepping up their collaboration. “Wärtsilä and Aalto University have a long history of cooperation, which has been most active in engine research. Wärtsilä has also participated actively in Aalto University’s project courses, such as Product Development Project and International Design Business Management. This agreement is a continuation of that cooperation but also a step that will open new possibilities in the areas of research, talent and skills and campus and ecosystem collaboration for both parties,” noted Kari Hietanen, Executive Vice President, Corporate Relations and Legal Affairs at Wärtsilä. Wärtsilä and Aalto University expect that the new mode of cooperation will result in new research projects and interaction with students that will support both parties’ strategies of creating solutions for a sustainable future. With the signing of this partnership agreement Wärtsilä is looking forward to working together with Aalto University in new areas of research. In a business that is increasingly based on digital solutions and networks between different partners and stakeholders, one of the areas where Wärtsilä is very interested in is cyber security. "Recent studies have prompted us to consider what the key issue is, in terms of cyber security and security in general. We should ask “how can we strengthen trust?” rather than "how can we strengthen security?" In principle, cybersecurity is a question of trust – its preservation and consolidation. Security and trust go hand in hand. Trust is manifested as a strong value for both societies and businesses. 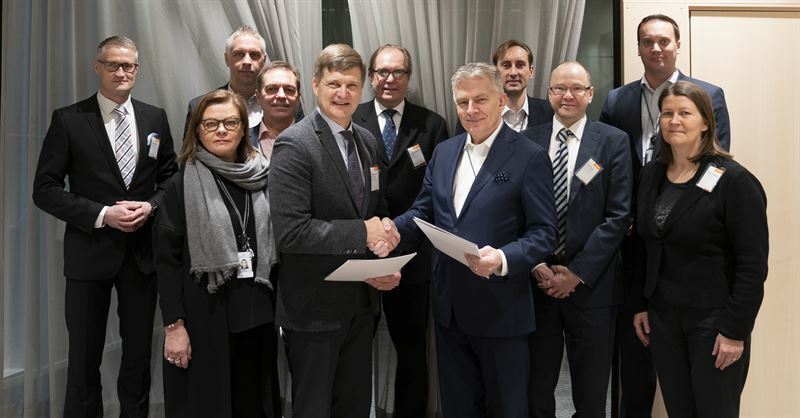 This partnership opens the possibility of Wärtsilä providing a real-life environment to support our cyber research," said Jarno Limnéll, Professor of Practice at Aalto University in the event following the signing of the partnership agreement. Wärtsilä and Aalto University will also start to explore the possibilities of sharing spaces and opening up infrastructures on the Aalto campus as well as on the Wärtsilä Helsinki Campus and other Wärtsilä premises. “Wärtsilä Smart Technology Hub welcomes Aalto University students and researchers as well as other universities and colleges to come and cooperate and co-create with Wärtsilians and other partners in the Smart Technology Hub,“ said Hannu Mäntymaa, Director for R&D and Engineering at Wärtsilä. “We are very happy with the long-standing and solid cooperation with Aalto University. With digitalization and sustainability playing an ever-increasing role in the businesses of Wärtsilä, we have the need to broaden our cooperation to areas that can support us in this change. We expect that our updated mode of partnership will result in projects and collaboration in new areas which support Wärtsilä’s business,” says Jaakko Eskola, President and CEO of Wärtsilä Corporation.